Orlando, Fla., June 22, 2015 /3BL Media/ — There is one week left to nominate environmental volunteers for Orlando’s inaugural Cox Conserves Heroes program. Nominations are being accepted through June 29 at www.9family.com for volunteers who are creating, preserving or enhancing outdoor spaces. Nominee activities must be performed on a volunteer basis and may not be part of an individual’s paid job. Through its 9 Family Connection brand, WFTV Channel 9 is presenting the program in partnership with The Trust for Public Land. A total of $20,000 will be donated to local environmental nonprofits on behalf of the winner and finalists. A judging panel of civic and environmental leaders will select three finalists who will then compete to be named Orlando’s 2015 Cox Conserves Hero. The winner will be chosen through an online public vote, which will take place in August. Volunteers in the following counties are eligible: Brevard, Flagler, Lake, Marion, Orange, Osceola, Polk, Seminole and Volusia. 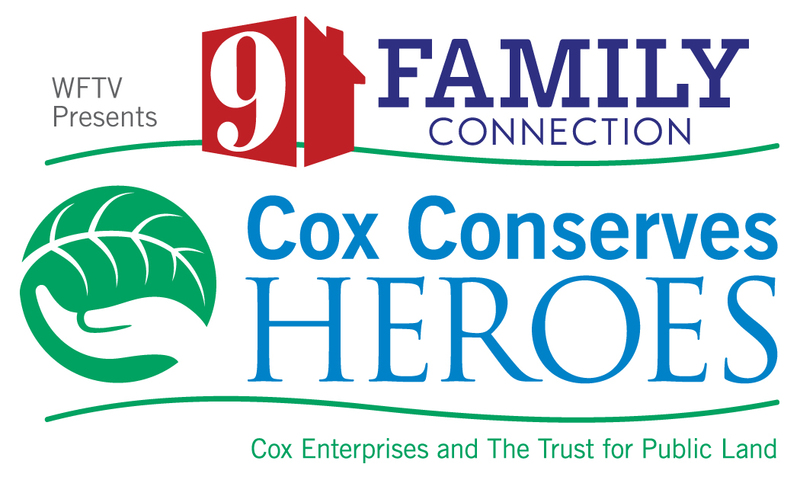 The national Cox Conserves Heroes program was created in 2008 through a partnership between The Trust for Public Land and Cox Enterprises, the parent company of WFTV Channel 9. The partnership stems from Cox Enterprises’ national Cox Conserves sustainability program that focuses on reducing waste and energy consumption, conserving water and inspiring eco-friendly behavior. Part of Cox Media Group, WFTV Channel 9 is an ABC affiliate serving Central Florida. Cox Media Group is an integrated broadcasting, publishing, direct marketing and digital media company that includes the national advertising rep firms of CoxReps. Additionally, CMG owns Cox Target Media, which operates Valpak, one of North America’s leading direct marketing companies, and Savings.com, a leading online source for savings. The company’s operations currently include 14 broadcast television stations and one local cable channel, 59 radio stations, seven daily newspapers and more than a dozen non-daily publications, and more than 100 digital services. CMG currently operates in more than 20 media markets and reaches approximately 52 million Americans weekly, including more than 31 million TV viewers, more than 3.5 million print and online newspaper readers, and more than 14 million radio listeners. For more information about Cox Media Group, please check us out online at www.coxmediagroup.com. The Trust for Public Land creates parks and protects land for people, ensuring healthy, livable communities for generations to come. Nearly ten million people live within a ten-minute walk of a Trust for Public Land park, garden, or natural area, and millions more visit these sites every year. Learn more at tpl.org. Launched in 2007 by Chairman Jim Kennedy, Cox Conserves is Cox Enterprises' national sustainability program. Cox Conserves focuses on reducing waste and energy consumption, as well as conserving water. The program engages each of the company's major subsidiaries (Cox Communications, Cox Automotive and Cox Media Group) and encourages Cox Enterprises' 50,000 employees and their families to engage in eco-friendly practices. The company's sustainability goals are to send zero waste to landfill by 2024 and become carbon and water neutral by 2044. The company also presents the Cox Conserves Sustainability Survey, a nationwide survey that examines sustainability opportunities and challenges for small and medium-sized businesses.